1More’s critically and publicly acclaimed Triple Driver were followed by a new model at the beginning of the year: the 1More Quad Driver, which incremented the driver count by one while also bringing a completely new design to the table. Thankfully, the change in appearance did not bring a complete change in tuning: the Quad Driver are as balanced and on the verge of neutrality as their predecessors, bringing some improvements to the table without revolutions. Disclaimer: Tom at 1More Europe sent this unit free of charge. Thanks to him and my colleagues at Hardware Upgrade. 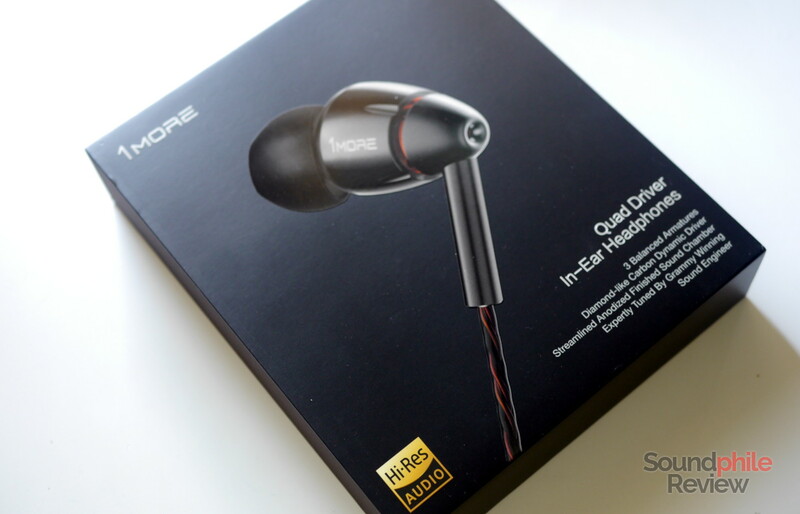 Additional information is available on 1More’s website, where the company sells the Quad Driver at $199. 1More has this signature way of packaging their products which includes making boxes such as they remind you of books, with fake pages printed on the sides and everything. This same model was used for the Quad Driver, but this time there is an additional cardboard sleeve on top of it. 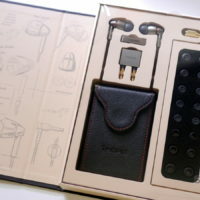 The box holds the earphones themselves, a hard carrying case covered in pleather, a 3.5 mm to 6.3 mm adapter, an aeroplane adapter, a metal shirt clip and a vast array of eartips that includes six pairs of silicone tips and three pairs of foam tips in different sizes. There are also a few leaflets and a sticker with 1More’s bear mascot. The 1More Quad Driver’s design is a bit futuristic: the general shape of the shell is conical, with a cut that reveals a red ring. It looks almost like an aeroplane’s jet engine. The same red metal is visible from the tip of the cone. The nozzle is angled, much like that of the Triple Driver. Everything is rounded and smooth, with a gunmetal colour and matte finish that accentuate the engine similarity and the futuristic impression. 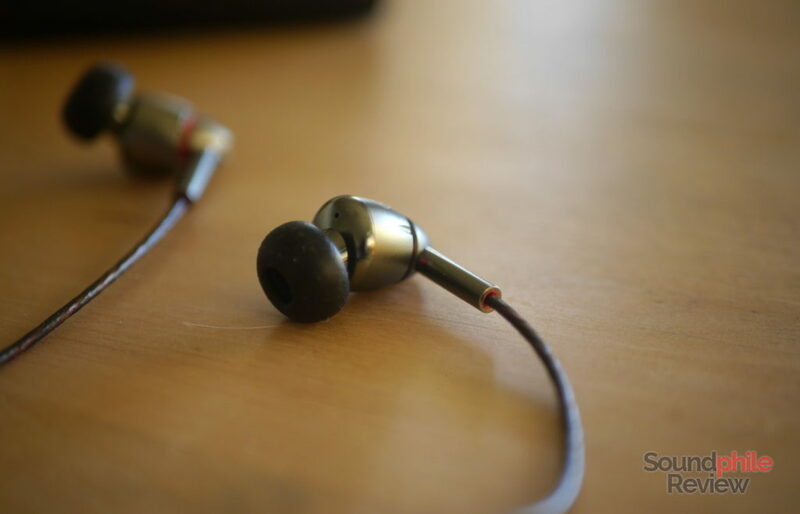 Every single part is made of metal, most probably aluminium, including the in-line remote (which is identical to the one used on the Xiaomi Mi In-Ear Headphones Pro HD). Etchings on the side of the shells carry the logo and channel. 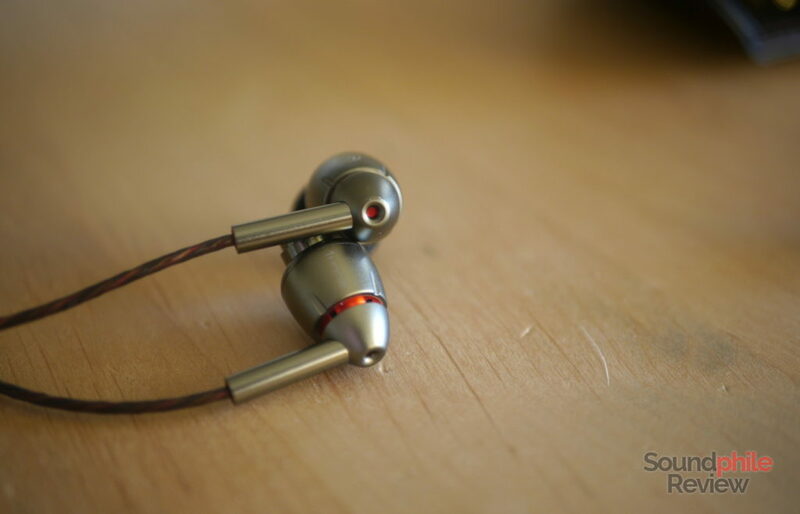 The 1More Quad Driver is almost perfectly symmetrical, with the exception of the nozzle: it is off-axis, and this in turn makes the earphones not reversible (you can’t wear the left on the right and viceversa, plus you can’t wear them upside-down to have the cable run around the ear). Having the channel etched on each shell is therefore not that useful – it is pretty easy to tell the two apart. It is built very well, with aluminium screaming “premium” – the way it was worked leads to it being smooth and satin-like to the touch; the perfect assembly that leaves no gaps between components and makes everything level is another nice touch. The only weak point is the cable, which is a bit flimsy and only covered in plastic; covering it with braided cloth and making it a bit larger could have made it not only more attractive, but also more resistant. I can wear the 1More Quad Driver for hours before feeling any fatigue: the earphones are so good in this respect that I barely notice I am wearing them. This is probably caused by the relatively small size of the shells and by their rounded shape that make them fit in the ears without pressing too much against the pinnae or having any sharp edge (hey, KZ ZS6, I’m looking at you). Just like the Triple Driver, the 1More Quad Driver are not good at providing isolation: more often than not, wearing them does not make a real difference in how you hear sounds coming from around you, so noisy environments tend to be not the best place to use the Quad Driver. The cable has a right-angled jack with a good strain relief system made of rubber, that should make it last for a long time even despite the stress using it with a mobile phone surely causes to the cable. The cable itself is covered in rubberised plastic, which is not dyed and therefore shows the colour of cables inside: they are black and red, twisted so they create a spiral. 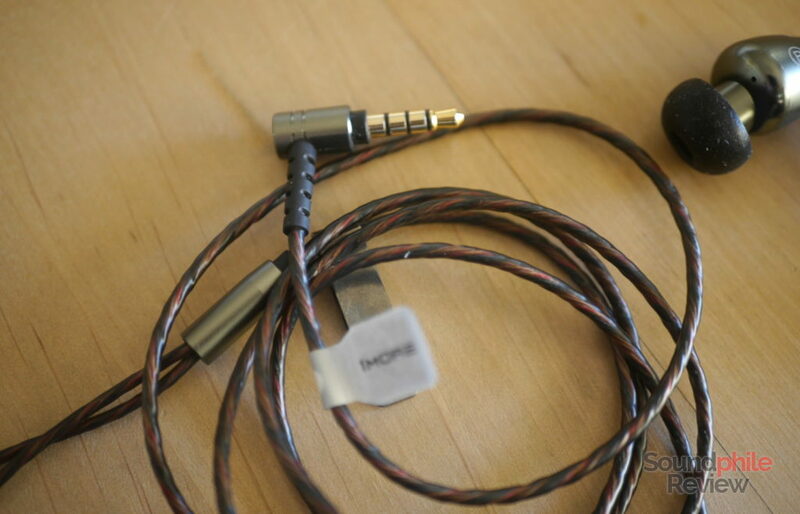 In my opinion this is a step back from cables covered in braided fabric, as the cable is really thin and I would not bet too much on its durability – though I really hope I am misjudging it. The microphone on the in-line remote is good quality and allows one to manage calls even in noisy situations (e.g. the subway). It is often necessary to speak while holding the microphone near one’s mouth in order to have the best audio quality, otherwise the other person will hear the voice as distant and not always clear. I tested the 1More Quad Driver with the usual set of sources, but mainly Topping DX7 (using an iFi IEMatch), Venture Electronics Odyssey and Cayin N5ii, with FLAC files in standard resolution. 100 hours of break-in were applied. I also used them with my Honor 9 smartphone in order to test the microphone. The 1More Quad Driver take everything good about their lesser siblings, the Triple Driver, and add something good of their own. It is rare to find a product that only brings improvements over the predecessors, but this is exactly the case. The sound signature is mostly unaltered, and is therefore clean and neutral. Soundstage is nowhere near open headphones or large-sounding IEMs such as the BGVP DMG or Tin Audio T2, but it is close enough to make you feel in the centre of a large room where the musicians are playing in different spots. Imaging has good accuracy and allows one to locate the instruments in space pretty well. Instrument separation is very good and the most apparent improvement over the Triple Driver: instruments are now easily distinguishable even in crowded tracks and the sensation of closure and congestion is almost all but gone. As you never change a winning team, 1More decided not to change the tuning in the lower section. Bass is in fact almost identical to that of the Triple Driver, and that means that it is almost neutral, well controlled and with more-than-decent speed. In terms of quantity, 1More got an almost perfectly neutral response that extends down to 25 Hz. It can sometimes sound a bit more present than a perfectly flat response would, but the difference from a ruler-flat response is small and is often negligible if you are not paying extremely close attention. Control is really good: the Quad Driver can manage different bass lines operating at the same time without messing them up, and therefore preserving a good level of detail. Transient response is decently fast and makes bass good with impacts. Midrange is – again! – neutral in its tuning but, contrary to that of the predecessors, it does sound vivacious and lively. Its tuning is (almost) perfectly balanced and I can’t hear any emphasis, so it is able to reproduce an incredibly wide array of instruments without any of them sounding better or worse – they all sound really good! This makes it easy to immerse oneself in the music and be absorbed by it. Midrange is also full of details and even micro-details: the company flaunts the ability to hear “a singer’s breath [and] the shimmer of a cymbal” – and that’s not far-fetched at all. It is more than decently fast, carrying a sense of impact with drums and plucked instruments that makes them pop out and feel realistic. That is to say that drums sound like they’re a real instrument that produces a loud but short sound that dies in little time, instead of a generic “thump” without depth or with a long duration. That’s the kind of detail that differentiates quality sound from average sound. Treble is almost perfectly executed: it is correctly placed in the mix, appearing in line with lows and mids, and it has an extension that’s good enough to give it air and space. 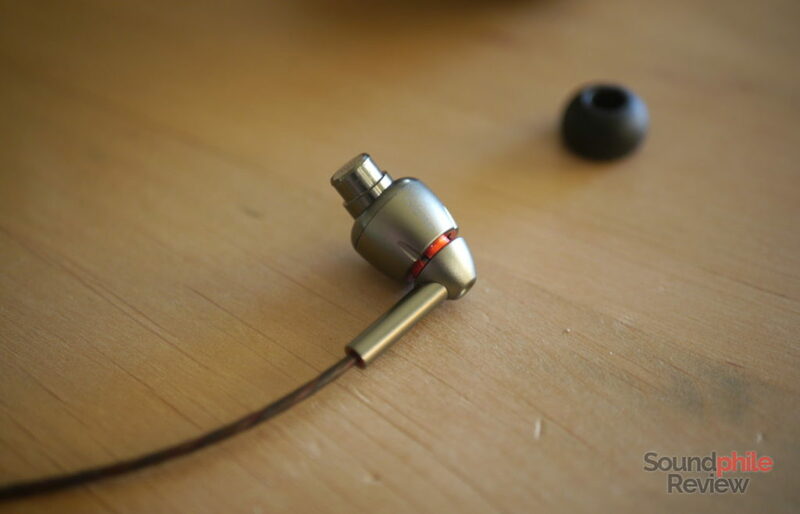 It is not as sparkling and vivid as on headphones such as the Tin Audio T2 Pro or the RHA T20i, but to counter that it is finely detailed. Though detail is not extreme, it is more than enough to let you hear many small nuances in the drummer’s activity on cymbals. Due to their neutral tuning, the 1More Quad Driver are good for all genres you might throw at them. Whether you like to listen to the Dave Brubeck Quartet, to Avicii, to Burzum or to Pink Floyd, or anything else, the Quad Driver are able to manage it with competence. 1More Triple Driver: the only notable difference between the two is the extension of treble, which is superior on the Quad Driver, and the fact that it is just a tiny bit more forward in the mix. Everything else is roughly the same, at least in terms of tuning. Technical ability is another story: the soundstage is wider and deeper on the Quad Driver, and instrument separation is better and allows for better clarity in congested tracks. 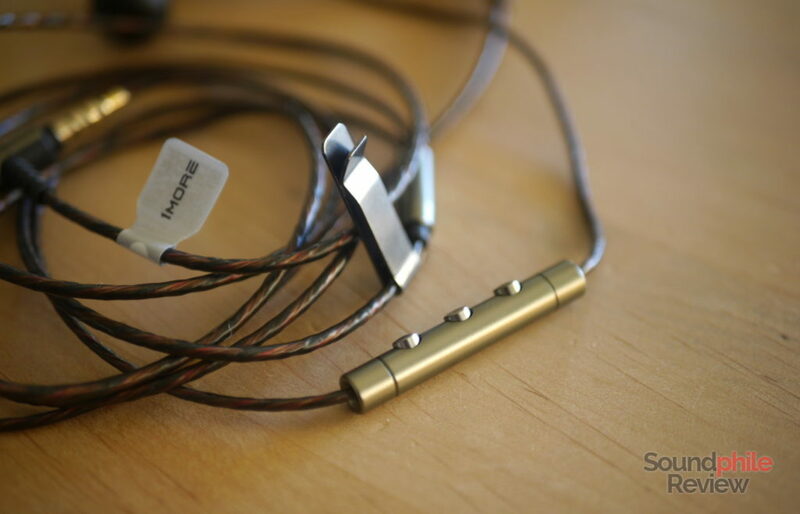 Tin Audio T2: the T2 (and their Pro sibling) are really similar to the Quad Driver in tuning, as they are both neutral. The T2 are a bit bright, however, and are less present in the lower section of bass. The Quad Driver are better when it comes to bass presence and extension, but lose in terms of soundstage width and depth and speed, while comparing instrument separation, imaging and detail leads to a tie. BGVP DMG: the BGVP DMG are exceptional and that’s an established fact. These (cheaper) competitors are almost as neutral, but they differ in a few, key areas: whereas bass is largely similar in both quantity and quality, with depth being slightly less extended, midrange and treble are where the two differ the most. Treble is more emphasised and more detailed; it pops out much more and is more easily heard – therefore details are easier to pick up. Midrange is a bit brighter, to much advantage for brass instruments and electric guitars that sound crisper and (subjectively) more enjoyable. Detail is, however, better on the DMG throughout the whole spectrum, as is instrument separation and soundstage width. 1More corrected the few issues the Triple Driver had, added a balanced armature and churned out a new design – thus the 1More Quad Driver were born. As I previously mentioned, it is rare for companies to be able to correct flaws in products without introducing new ones, but 1More achieved it almost completely with this new model, especially on the acoustic front. The only negative side is that the Quad Driver’s price is double that of the Triple Driver. What this higher price tag affords you, though, is a highly competent product that receives well-deserved praises – and it now receives my own, too. At $199, the Quad Driver offer loads of value and are still very competitive. 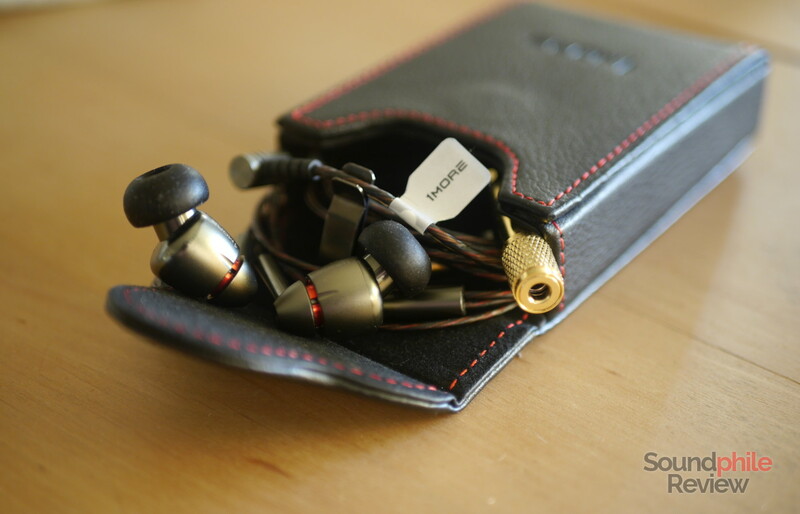 I do not think the difference in sound quality justifies the price hike from the Triple Driver, yet they are worth the asking price – if anything, it is the lesser sibling that might be underpriced, not these that are overpriced. The Quad Driver are really a treat. 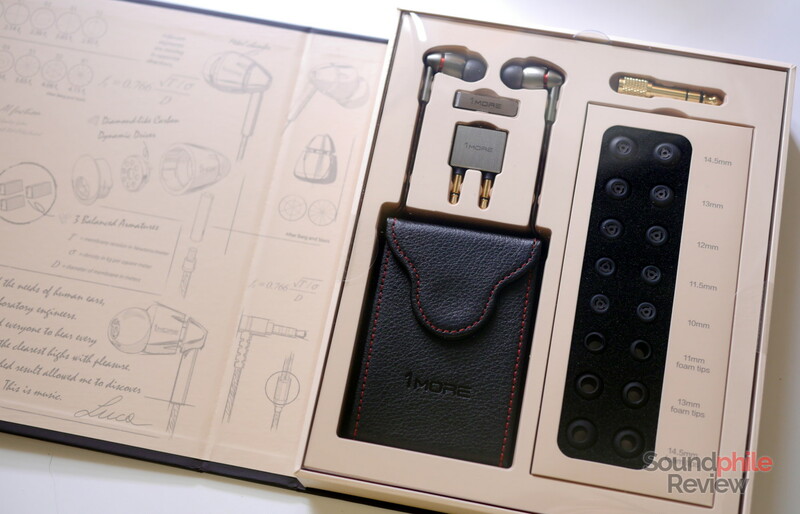 With their neutral response, high detail and good technical ability, they surely are among the best earphones you can find in the mid range. 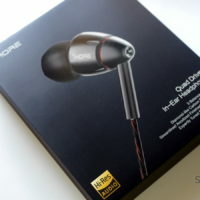 Hi, I need an advice about a pair of earphones. I mainly listen to hip hop music and I was looking for a good product under 40 euros, do you have anything to recommend me?